PostConsumer Reports: Why I Cringe Every Time Someone Says "I hate Christian music"
Why I Cringe Every Time Someone Says "I hate Christian music"
Christian Music is dead! Long live Christian Music! 1. Since there is so much music out there that could be considered "Christian" it means almost nothing to say you don't like "Christian" music. 2. For people to say "I hate 'Christian' music" means they are (most likely) not connecting with God through the music that fills their lives because the "Christian" and spiritually themed music they know of is shallow, forced, derivative, unoriginal, and over marketed. This is a sad sad thing. "I don't listen to Christian music." "Christian music is just a ripoff of secular music." "Whatever that stuff they play on Christian radio is just awful." I can't really tell you what's on Christian radio these days. As a worship leader some of the Chris Tomlin songs are recognizable but most everything else that has come out recently strikes me as bland drivel. It's just a bunch of derivative 4-6 chord chord progressions containing non-melody melodies with some guy that sounds like your mom's version of Scott Stapp wallowing his way through theologically deficient "lyrics". But that's not fair, I actually don't really listen to Christian radio anymore. I can't stomach it for very long, to be honest. But the above statements in bold leave me more than a little confused. What exactly do these people mean by saying they "hate" Christian music? Do they not like J.S. Bach or Handel or the songs in a church hymnal or Ralph Vaughan Williams (who wasn't actually a Christian, BTW) or Morten Lauridsen or Marty Haugen or Jacque Berthier or Larry Norman or Hillsong or Mahalia Jackson or Sufjan Stevens or Charles Wesley or Lacrae or Johnny Cash or P.O.D. or Gregorian Chant or Sandi Patty or Ladysmith Blackmambazo or...hmmm...there seems to be a lot of "Christian"-type music out there. The people making the "I hate" statement couldn't possibly hate ALL those artists, could they? So, OK, I'll admit it—I'm being coy. It is pretty obvious what people mean: they hate mainstream CCM radio, the adult contemporary or Christian Hit Radio (CHR) of the saccharine, family friendly variety. When people say they hate "Christian music" this is basically the only thing they are referring to. But see, I still listen to a lot of Christian oriented music and not just the stuff I love the most from when I was a kid. A lot of it is new. Very new. From the likes of Derek Webb, Andrew Osenga, Jeremy Casella, Rain For Roots, David Crowder, Peter Furler, Matt Redman, Charlie Peacock and a couple of Kickstarter funded albums I'm still waiting on to be released (I'm talking to you Waterdeep and Steve Taylor!) a majority of the new music I've purchased in the past year has been "Christian". Almost none of it though, except for Crowder and Redman, has made or will make its way onto CCM radio. On top of this none of the artists I listed (none!) could be considered strange or "out there" music—it's all pretty conventional pop/folk/rock music. And yet there is no place for their music on "Christian" radio. To me the "I hate..." kind of statement is wrong on a number of levels—not necessarily "wrong" as in "incorrect" but wrong as in "this is a bad situation," "this just feels wrong," or "man, that was wrong what you just did right there." Saying, "I don't listen to Christian music" means someone has given up on the Contemporary Christian Music Industry and the Christian radio network set up to support this industry and thus it is a signal the industry is a sad wasteland devoid of though-provoking lyrics of theological depth and compelling music of great artistry. And thus we have some very prominent CCM artists who are now in many ways post-CCM artists attempting to make some very necessary distinctions between "Christian Music" (that is, music coming out of the industry) and music made by Christians (which could include CCM but really includes a much wider swath of artists and artistic styles. Derek Webb and Jon Foreman of Switchfoot have been some of the more articulate proponents of this needed, if still conflicting correction (I say conflicting because it gets increasingly difficult to discern between what is obviously music written for the Church or Christian culture and music that is uplifting, spiritual, political, etc in nature—a topic certainly needing to be explored in another article). Essentially, Webb and Foreman are proponents for doing away with calling a song or a work of art "Christian", for Jesus didn't come to redeem a song, they say. There are some definite points in their argument worth considering that I touch on in my next article, but for now, focusing back on the CCM industry for a moment, I would say hating Christian music because all you know about is Christian radio is a horrible position to be in. Imagine this scenario: you go to a grocery store with a friend, and upon entering the cheese section you begin picking out some of your favorite varieties: Jarlsberg, smoked gouda, aged parmesan, extra sharp cheddar, and baby mozzarella. Your friend gives you a look of utter disgust and remarks, "That's disgusting, what are you doing? You don't actually like cheese do you?" You quip back, "What do you mean, are you telling me you don't like cheese? Have you even had cheese before?" Then your friend says, "Of course I've had cheese before. It was this awful, stinky, Gorgonzola stuff. I couldn't stand it." "But have you had any other kinds?" you say. "There are lots of other kinds." "Well no...but what I had I didn't like, so that was enough for me." Anybody reading this somewhat absurd dialogue knows how limited the cheese-hater's experience is, and for those of us who love cheese we also know how much they are missing out on. But the situation is the same for those of us who love and truly know all of what encompasses "Christian" music. There is so much to draw from in the "Christian" music world. Sure we might not have produced a Queen, a Paul Simon, an Elvis, a Michael Jackson, or The Beatles, but we do have Larry Norman, (early) Petra, Daniel Amos, Keith Green, Phil Keaggy, Rich Mullins, Charlie Peacock, John MIchael Talbot, and (the best work) of Michael W. Smith, Amy Grant, DCTalk, Newboys, Audio Adrenaline, and Jars of Clay. And there are so many other great artists that would not even fit into the CCM mold. In other words, saying you don't like "Christian" music is a lot like saying you don't like cheese when you've only had one kind your whole life. Let's draw from another example, a musical one this time. Anybody who truly knows anything about Country Music knows how ridiculous it is to say "I don't like country music" based off an opinion derived only from listening to pop-Country radio. There is so much great Country & Western and bluegrass and rockabilly and folk and alt-country and on and on and on "country" music out there it almost means nothing to say "I don't like Country kind of music." And yet there is a significant problem with this example, one pointed out by Derek Webb in the article I linked to above called "Safe For the Whole Family: The Marketing of Jesus," which is that "Christian" isn't a genre or style of music like Country or Hip Hop is, instead it is a descriptor of content. It signifies the music of focus contains "Christian" themes, narratives, perspectives, and beliefs. In other words, any style/genre of music that contains Christian imagery and themes or perhaps any kind of music intentionally written by a Christian person as an offering of love back to God (no matter what the explicit themes are) would be considered "Christian". This means we would end up with Christian Country, Christian Hip Hop, and even Christian Jazz and Classical Music. Derek Webb is very much not a fan of this, thinking we should do away with this this practice altogether. On some levels I would agree with him. Labeling something as "Christian" does not make it "safe" for us (as in "it's safe for the whole family!") and neither does it mean it is good for us (as Webb says). What good does it do to be told outright that something is Christian, as if the work itself has been sanctified beforehand, having a "God's Stamp of Approval" attached to it as a work of art? And yet, while acknowledging the tension and ambivalence involved in understanding the works of art that give meaning to our lives, I believe we cannot just get rid of labels. Instead, we must be able to articulate how "Christian" art is different and actually does different things to us. My next article, responding to Webb's article, attempts to explain the linguistic side of my argument, but the remainder of this article will focus more on the experiential side of partaking in art, specifically with music. You see, here is what makes me saddest of all in hearing someone indifferently quipping "I don't listen to Christian music" or passionately declaring "I hate Christian music": such a statement likely reveals this person is not connecting to God through music. This of course does not have to be true, as someone could very well connect to God through the music they sing with the people of God when they worship at their church (assuming they go to church) and thus they learn and take worship music with them into their daily lives (since "worship" music is basically sung prayers to God or sung statements about God). In this way the "Christian music" in their lives isn't attached to the music they listen to for pleasure but is instead associated with the music they internalize and memorize while worshiping as a member of the body of Christ. This is completely valid and if this is all the "Christian music" a person ever gets, then this is truly enough (I have a pretty high ecclesiology, you will find). Along with this, I find that even Christian people who don't like "Christian" music of the radio variety often end up liking music that would definitely be considered "Christian". My pastor, for instance, who has said a number of times that he doesn't listen to "Christian music", also loves listening to Newsboys, Enter the Worship Circle, Sons of Korah, and I'm sure other "Christian" artists. In other words they actually do listen to Christian music even though they say they don't out of a fear of being associated with CCM radio. I in no way want to create a dualism between "Christian" and "secular" musics where music other than the "Christian" kind cannot connect us with God or that God cannot use non-Christian music to speak to us or bring him glory. I am not bifurcating music into a only good camp with everything else being bad/evil. My reasons against this kind of dualism stem from the concept of Common Grace, which I touch on in my next article. Instead, I seek to simply point out that what happens when a Christian sincerely writes a song as an honest confession of their faith, as a "living offering" back to God, is radically different than when someone uses their God-given talent to write an amazing song. It is different in intent, form, function, and perhaps even identity as a work of art. I realize this takes us down (or up?) a tangled and treacherous path in discerning meaning, but I believe we must strive to find a language to describe the difference, a difference I believe to be significant. I am attempting to do this even as I struggle to find adequate enough words. So again, for now, let experience (as opposed to philosophizing) be our guide. As an example, I love "Eleanor Rigby" by Paul McCartney and The Beatles and it moves me nearly every time I listen to it. But that song is so vastly different than something like say, "How Great is Our God," by Chris Tomlin, a song, quite frankly I am getting a little tired of singing. Dare I go so far as to say "How Great is Our God" is different because it was written by someone open to and moved by the Holy Spirit? And if I were to try and attempt to make the most basic description of that song, a description that someone in the general public would be able to comprehend, wouldn't that description be "Christian"? It represents Christianity as a faith and Christ in its intent. Thus the simplest way to communicate what that song is, is "Christian" (I know, I know, it is also a "worship song" and that would be the next thing I would say about it in a conversation). To be sure, my conversations about "Christian" music and Christian artists nearly always contain much hemming and hawing on my part. I never know exactly how to define an artist. For instance, if somebody were to ask me, "Is Derek Webb a Christian artist?" here's how I would respond: "Sure, well, he's definitely a Christian and out of that springs all his art, and then basically a whole lot of his songs are specifically about Christianity and the Church. At the same time he doesn't really fit well in the Christian music industry, even though the music itself is pretty mainstream folk/rock/electronic sounding. Since becoming a solo artist he's basically separated himself from the CCM culture and his lyrics have always been a bit too edgy to be accepted by the soccer-mom crowd. He's kind of created his own niche. Still, when he was in Caedmon's a decent amount of his songs got played on Christian radio, and man, his music is so Christian oriented nearly all of the time he's definitely what I would call a "Christian" artist. In that way his music wouldn't really appeal to non-Christians, no matter how good it is. Man...actually, it's really hard to define what it means to make Christian music, but I know there's something different about it. There's definitely something different about Webb and what he's trying to do..."
Do you see how I go back and forth trying to describe who/what Webb is as an artist, simultaneously affirming and denying he's a Christian/"Christian" artist, my perspective looping back on itself? Do you find that confusing? Maybe that's how it should be. Maybe we should never feel exactly settled in how we describe things of great importance, as attempts at communicating meaning always need further refining and defining. And perhaps sometimes we have to use the most misused, most co-opted terms as a starting point to discovering meaning because they are the most general and basic to us all. Perhaps it's inherent to general terms to be the most potentially debatable and convoluted. This does not mean we should stop using them but should continually and intentionally make sure everyone in a conversation know what we means by such words. And I would be all for coming up with better terms and descriptions other than "Christian". Let's start that conversation and see what we come up with. I would probably be of the opinion we need more terms and not less, terms that can really help understand what we're listening to (if that even matters to us). Because here's the thing, anyone who says 1.) I don't like or I hate or I don't listen to Christian music, and 2.) is themselves a Christian, and 3.) does in fact like and listen to music doesn't really know what they're talking about and has just revealed they probably haven't taken the time to pursue a kind of "Christian" music they actually like. So, I'm done harping on Christian radio. It's actually a boring and fruitless conversation to keep having. It's like getting mad at McDonald's for marketing low-quality hamburgers to me. I already get both my music and my hamburgers elsewhere and I'd much rather recommend what music to actually listen to and what places to go eat at than to moan about what disgusts me about everything. So this article is going to end with a list of great outlets to discover new "Christian" music (websites, podcasts, radio stations). I have the great people at the "90's Christian Music Recovery Group" on Facebook to thank for these suggestions. If you ever find yourselves complaining about the dearth of intelligent and creative music made by Christians, come back to this list and discover something new. And I'll keep adding to the list if you have your own suggestions. 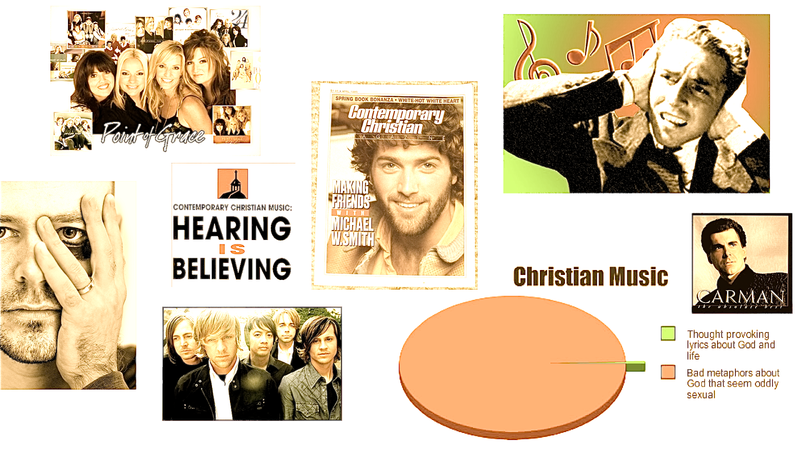 Next Article: Yes, There is Such as Christian Music: A Response to Derek Webb. *If you haven't noticed by now, I constantly go back and forth between using and not using scare quotes around the word "Christian" when referring to music. This is my intent. I am purposefully trying to use the word as a moving target, a term hard to pin down. Jeremy Begbie is Stealing My Ideas! "...has just revealed they probably haven't taken the time to pursue a kind of "Christian" music they actually like." Gist of it was that I don't see why one should bother going to the trouble, since liking "Christian" music isn't a virtue and disliking it isn't a sin to be repented of. If someone has heard lots of what flies under the banner of CCM and thinks the vast majority of it is beyond terrible, then so what? I used to feel guilt over this, personally, and tried to like it, but not anymore. There's too much great stuff out there that isn't "Christian" to waste time trying to like terrible art. Then I got on my secular/sacred soapbox and talked about how I think it's better to talk/think in terms of that distinction. I love all kind of sacred music -- music for the Church that I learned mostly in church. I listen to it outside of church sometimes, but it's sacred music, set apart for the Church in corporate worship. But most of the time, when I'm not at church, I listen to secular music. It might be written/performed by Christian artists, or it might not. If not then by common grace they have created something aesthetically pleasing, perhaps even transcendentally beautiful. Praise God. If they are Christians, then perhaps they are skilled enough in their craft that they can tell me something about our Lord without mentioning him by name seven times per couplet. At any rate, I am able to glorify God while/through listening to Miles Davis, Arcade Fire, Florence, Sufjan, Boards of Canada, Etta James, Dylan, Bjork, Beck, Radiohead... So why bother slogging through the glop to find something decent under the CCM banner? I occasionally hear something excellent (some stuff by Lecrae, In Christ Alone by the Gettys), but I don't think liking it makes me a better person or a better Christian. Anyway, that was the gist of it, only it was way more eloquent and persuasive. Stuart, thanks for commenting. Sorry you original got deleted. 1.) I think we've had vastly different experiences with the whole CCM thing. I've been exposed to so much of it that I know there's lots of slop but there's also lots of good stuff, just like mainstream "secular" music. Therefore it hurts a little when people just say that hate it outright--it would seem their experience is only limited to the slop. 2.) My contention is that it's ridiculous to limit the title "Christian" to only what's on Christian radio. There's just so much stuff out there. I'm not advocating liking terrible art. The whole article is about seeking after the good stuff. And hopefully I didn't give off any vibes that it's about feeling guilty. It's all about joy for me. Seeking out new music is a glorious pursuit. 3.) I would argue that it's still important to have music that expresses our faith. If you don't know already, let me make it clear that I'm never about some Jesus quotient for lyrics. That's not what I mean when I say "Christian". Rich Mullins and Charlie Peacock and Steve Taylor were able to articulate things about our shared faith that I never would have gotten on my own. I don't want to deny any of your experience in listening to the "secular" stuff. But the "Christian" stuff has been so formative for my life. But as I say, if you get good music in church, well then that's enough. However, I don't think it's fair to put all the weight on the shoulders of those who profess to hate christian music. You can't expect every person to follow 6 different music blogs, and research the members of each band and what theological camp each person falls into. Your cheese analogy is good, but the one that makes the most sense to me is beer. I love beer, but when somebody says they don't like beer- I get it. Walk into 95% of bars in this town or this country and say "one beer please" and prepare to be disappointed, because you aren't going to get anything worth drinking. You'll get the watered-down stuff that appeals to the most people and thus is the most economical and reproducible. I'm sure you see where I'm going with this. In the same way, the christian music industry is a real thing and it really affects what we have access to. (or at least easy access to) I don't expect people to spend 11 dollars on DFH or Founders beer if they think beer means "61 calories of fizzy alcoholic rice-water." Don't expect people to track down good 'christian' music made by Gungor, Rich Mullins, Dustin Kensrue, or even artists here in Peoria if all the industry/culture will promote is "61 calories of family-safe feel-good pop." I think you make some great points, but I'd love for your next series to be a primer on what is good out there. Don't tell us I'm wrong about the state of the christian music industry- show us. Eric, thanks for your comment. It's actually got me thinking some more, so, with your permission, I'd like to put it into another blog post and then I'll have my own response. Whad'ya think? Wow Chris, nice blog. I’ve been involved with music, as a music major(started in 1971 and graduated in 2010 from ISU in Indiana), and Christian music, from the late ‘60’s. I think of people like Bach and Handel, Faure, Mendelsohn, Rachmaninoff, Bruckner, and other classical writers, JMT, the Daniel Amos clan, U2, Dave Brubeck(he composed for the Catholic Church along with his jazz), the great ones like Keaggy, Keith Green, and the Talbot Brothers, many who were quiet about their faith, but were Christians within the music Industry, Roger McQuinn(the Byrds), Larry Knectel(piano on Bridge Over Troubled Water and Keyboards and Bass on good Vibrations), a number of the members of The Wrecking Crew, Dan Huff(besides White Heart, he produced Modonna and Mettallica), and of course, Bob Dylan and most of Kansas……Musicians within the industry have had a great influence and Christian music comes out, even the quietly faithful Mr Eric Clapton has touched so many with his songs that reflect a hope that God will keep us in all our needs and hurts. So, I say, let them be short sighted, God is so much bigger anyway, Let’s not limit or put Him in a box! Again, nice blog, and thanks for the soapbox to stand on…. Great article. But with all those great early artists you mentioned you forgot my favorite: The 2nd Chapter of Acts (though you mentioned Annie Herring). I worked at a "Christian" radio station in the mid-70s when Christian rock was still in its infancy, and we had to wait until after 10:00 PM to play it. I still really like the sound of the Maranatha groups like The Way and Love Song, and even converted some of those old LPs to mp3. That way I have something to listen to that I enjoy rahter than the pablum the local CCM station plays. Even though musically it isn't great, the depth of the lyrics is far more satisfying to the soul. Seriously? If someone doesn't like Christian music they aren't connecting with God? Wow that's pretty narsicistic. I am a believer and am tired of the bubble gum feel good crap. Most people feel it's forced. I'm wondering how much of my article you actually read. Also there are 3 other articles in this series on "Christian" music. If all you took from it is that I don't think people can connect with God if they don't like Christian music and that I'm advocating for bubble gum feel good crap, then I don't think you've read much of what I've written. I became an evangelical Christian at UCLA in the early 70's, around when "Jesus Music" was in its infancy. Every album release was a big deal. We had our favorites such as Keith Green, Larry Norman, Phil Keaggy, Randy Stonehill, etc. And when a mainstream artist put out Christian music, such as B.J. Thomas (a bit tame) or Paul Stookey (still my favorite), it was huge. One of my favorite concerts was a Barry McGuire/2nd Chapter of Acts show at Church on the Way. I still listen to the live album that was recorded on that tour. Since most of us college Jesus Freaks were not deeply connected to one particular church, those musicians were vital to our spiritual growth. Rock and Roll was our main cultural influence at the time, so to have Christians speaking in our own language was deeply important. Thanks for the trip down memory lane.